Mike is arranging seven of his various awards and commendations on a shelf in his office. If he insists that his hard-fought Class of 1999 Math Award be placed in the center, in how many different orders could he arrange the seven items? First, as I did above, you must account for any special conditions or restrictions. The Math Award must go in the middle, so there’s only one choice for Position 4. Once all the restrictions are accounted for, start filling in the rest of the spaces. To fill Position 1, Mike has 6 different awards to choose from. Say, for argument’s sake, he chooses the Invisible Man Award next. To fill the next spot, since he used up the Invisible Man Award, he has 5 awards left to choose from. Once he chooses the Acne League – Most Improved award for Position 2, he has 4 choices for Position 3. He continues this process until he’s filled all the positions. When solving a possibilities problem, set up the hangman blanks, then imagine yourself actually performing the task described. First take care of special conditions or restrictions, and then take care of everything else. At every step, ask yourself “How many choices do I have?” And then ask yourself “How many choices do I have now?” And then – you guessed it – ask yourself how many choices you have again. Stop when you run out of choices. Possibly you’re interested in more practice? *Aside from this footnote, I’m deliberately avoiding the terms “permutation,” “combination,” and “factorial” here. That’s not because I don’t know them; it’s because I’ve found that they manufacture more confusion than they alleviate on the SAT. 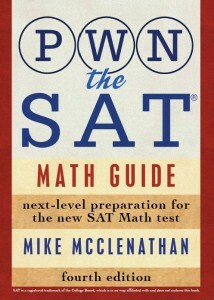 Remember: The SAT is not a math test! If you prefer to solve the questions laid out here by cramming them into nPr and nCr notations in your calculator, be my guest, but don’t cry to me when you miss counting questions on the SAT. Do you think you could explain number 19 a bit? I’m still confused on that one. Sure! The basic idea is that there are 10 cards that could be pulled for when he chooses the first card, then 9 choices left for the second pull, 8 choices left for the 3rd pull, and 7 choices left for the fourth. why didn’t we say the first choice we should pick one out of 10 = 1/10 ? in question #19, in the last sentence, i thought it meant that how many card arrangement could be made out of the four chosen cards. don’t you think the last sentence is a bit ambiguous ? Also, if it is ambiguous, do such sentence structure in math come up in exam ? Can’t you just take the factorial of 6? I remember a long time ago my Algebra teacher told me that possibility questions could be solved with factorials. Yes, the awards problem simplifies to 6!. But that’s only because there’s only one constraint on it. It would get more complicated if, for example, 3 of the awards needed to go in the middle 3 spots, and the other awards could go anywhere. You could still reduce the solution to factorials (3!4! ), but i doubt it would be any faster than just listing out the possibilities for each position as done above. for number 16, isn’t it suppose be like 1 3 2 1 1 ? Sorry, which question are you referring to? There’s no #16 in this post. For number 17. I don’t understand it. Let us have ABCDE, for the five family members respectively. A and F have only 1 possibility. Then, for BCD in the middle, there are 3*2*1 possibilities. Why is the answer 12? Alicia’s mom and dad just have to be on opposite ends. So Alicia could put her mom first and her dad last, or she could put her dad first and her mom last. 2 choices for first position, then 1 choice for last position. Then you fill in the middle positions (as you did correctly): 3 choices, 2 choices, one choice. Oh. I thought it was her mom first and then dad last. I didn’t think about the second option. Do you have any more questions with probability? Also, I am a 7th grader and I just took my SAT on Jan 26. I received a 660 in math and a 1910 overall. However, I think a LOT of my mistakes in math are careless. I just did your diagnostic 1 and I got 17/20. 2 of them were careless; one was not. I have a post about probability, and I think there are a few more in the diagnostic drills, but I’d caution you against worrying TOO much about probability (for the SAT, at least). Probability questions typically only occur about once per test, and HARD probability questions are very rare. It really can’t be this easy. I’ve watched so many videos on youtube about this and I’ve gotten so confused between combinations and permutations! Its so easy that I’m almost believe I’m being deceived. I have a problem with a concept , when i think about for example what to put in the second spot I’m confused to think 1/6 or just 6 🙁 can you help clear that up? thanks! I’m afraid I don’t understand the question—can you rephrase? sure, #20 “To fill Position 1, Mike has 6 different awards to choose from.” I’m confused about whether to write 6 or 1/6 because we need to choose one of the six awards. Oh. Write 6—in a counting question like this, we’re trying to come up with the total number of ways something can be done. We want our answer to be a big number! So we can use this way instead of permutation and combination way? Actually nvm I understand thats because i already used up two choices in the beginning. Because you don’t have 5 choices for the second slot. Only 3 people (the non-parent family members) can go there. Actually, I laugh at ALL the little jokes in your blog – thanks!